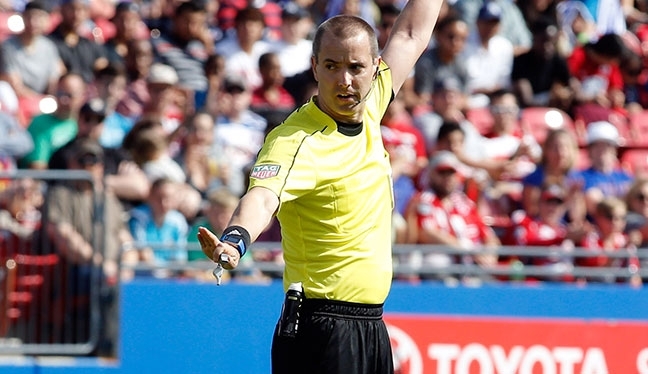 Mark Geiger, Joe Fletcher, CJ Morgante and Jair Marrufo have been assigned to the 2017 FIFA Confederations Cup. The four PRO officials will head to Russia for the tournament, which is a prelude to the 2018 FIFA World Cup, from June 17 to July 2. FIFA has appointed 36 match officials, representing all six confederations and, in their preparations, they have all been under the guidance and supervision of the chairman of the FIFA Referees Committee, Pierluigi Collina, and the FIFA Head of Refereeing, Massimo Busacca. “These officials are all potential candidates for next year’s flagship football event in Russia, and a high-profile tournament like the FIFA Confederations Cup 2017 is key to their preparation,” Collina said on FIFA.com. The Confederations Cup will feature a piece of history, with video assistant referee (VAR) tests taking place, supporting referees with match-changing decisions. Those decisions include serious incidents such as goals, penalty decisions, direct red cards and cases of mistaken identity, and the VARs will be in operation to provide information to the referee on the field of play in order to correct any clear mistakes. The referees will also be able to call upon goal-line technology (GLT) during the tournament, which is being played in Kazan, Moscow, Saint Petersburg and Sochi.